Hoe hoe grow: What's your poison ? Spring is finally with us, with all its excitement and pleasures - and one of the greatest is seed sowing. This season we will concentrating on our new subtropical area in the garden, and I am thoroughly enjoying propagating new plants to fill it with. We have bought some 'big boys' - tree ferns, hardy palms and a phormium, but I am growing lots of 'infill', both flowers and foliage, to give the area a feeling of lush, abundant growth which is fundamental to exotic gardening. 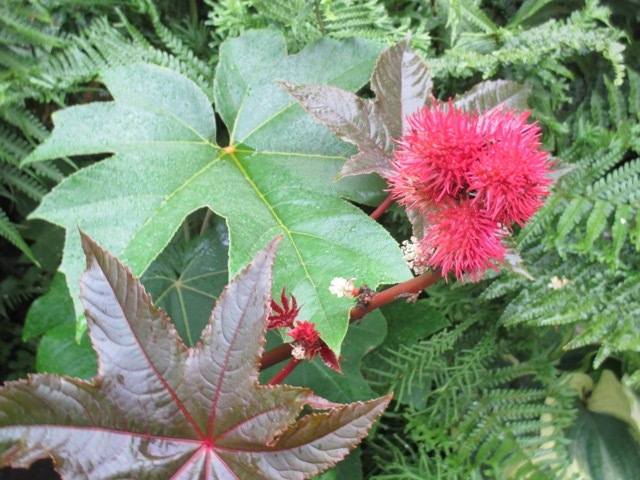 One of the best annual fillers for exotic foliage is Ricinus, and I have grown some every year for a very long time. Not only are the leaves dramatic, but the seedpods are unusual too, almost like colourful sweet chestnuts! I usually just sow and grow one single packet every spring, but because there is plenty of bare earth to fill, in the new garden, I am growing a bumper packet of 5 varieties from Jungle Seeds. 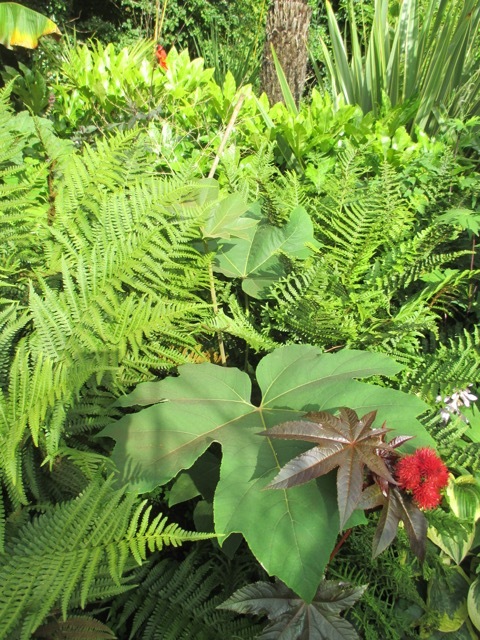 Ricinus Carmencita Red - a measly 5' tall ! Ricinus Carmencita Pink - same measly 5' ! 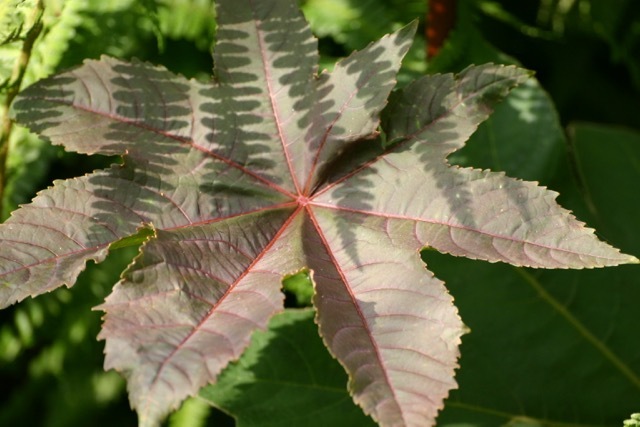 Ricinus New Zealand Purple - a new one on me, but it sounds fantastic as it grows to 7' and has dark, shiny foliage. 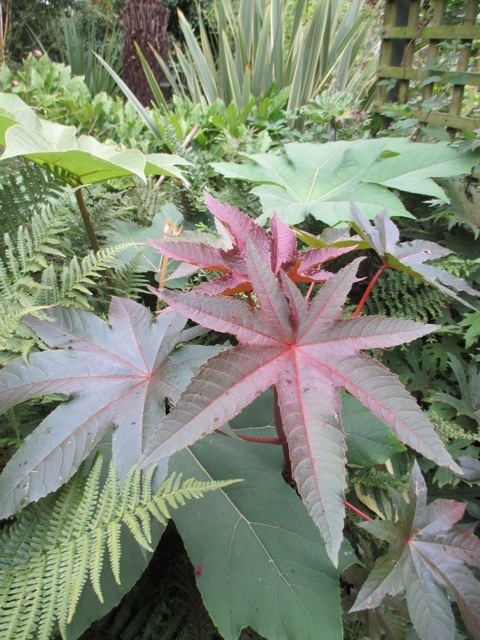 Ricinus Zanzibarensis - can reach up to 10' in a season! Although I have never had any problems with germination of Ricinus seeds in the past, I decided to sow one packet early (Carmencita Pink), to compare with height and health of later grown plants. In the past germination rates have been high - so they should be, as the seeds are quite expensive. I was extremely disappointed with the germination rate of the Carmencita seeds, which I sowed in early February, as up to date there has only been one seed which germinated. Now, this could be due to my bad guardianship, or to a rogue batch of seeds, or to a million other reasons, but one thing is for sure - I want to give the other Ricinus seeds the very best chance of germination. So, I went online and did my research, and, yes, someone has conducted trials regarding the optimum conditions for germination! 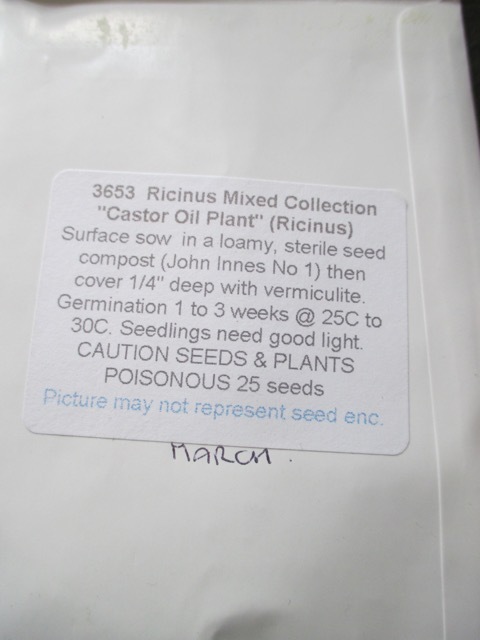 In the trial 4 ways to treat the Ricinus seeds were used. One group were not soaked at all, one group was soaked for 12 hours, one group for 24 hours and one group for 36 hours. A significantly higher percentage germinated after 24 hours soaked in water. Q.E.D. I must stress at this point that Ricinus seeds are extremely poisonous and should be handled with great care. I make sure that mine are stored in a safe place, and that they are never left lying around at any stage. I wash my hands well after handling them, and I even threw the tubs away that these seeds were soaked in. 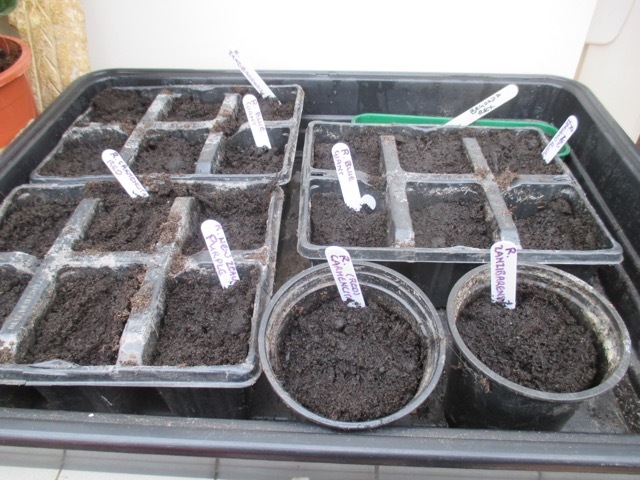 After my failure with 'Carmencita Pink', I made sure I followed sowing instructions closely,and, once the other seeds were sown, I put them all in the propagator to cook. In the photo below, the plant you can see on the far left is the only 'Carmencita Pink' to germinate. It is growing strongly, and enjoying the light and warmth. I will be interested to see how it compares to the others throughout the season. Will the others catch up in height, or will its early start be a benefit? I love your sub-tropical garden. It's a work of art! I can't wait to see pictures after all the sown seeds are established. Growing 10' tall plants.....I would love to be a bird on the fence when your neighbors happen to look up and see them for the first time! Thank you for your kind comments! The Ricinus are starting to germinate now, and I swear one grew about 5cm yesterday! Ha ha ha ! I hope they grow like Jack's beanstalk!! Fun! You've certainly had success with seed-starting! I'm amazed at the progress of my seeds this year, too. I just planted some Cosmos, Zinnias, and Snapdragons last weekend, and they're already sprouting! That seems really fast. They're not under grow lights--just in the sunroom in a seed-starting kit with a plastic cover. I hope they'll continue to thrive until May when I can plant them in the garden. Good luck with your Ricinus species! They're fascinating plants. Gosh, you sound as if you have a lot of different seeds on the go! I am growing Cosmos Xanthos for the first time this year, and also Zinnia Candycane. Which varieties have you chosen? I didn't realise there were so many different Ricinus varieties. They are beautiful and so dramatic. Good luck with them. 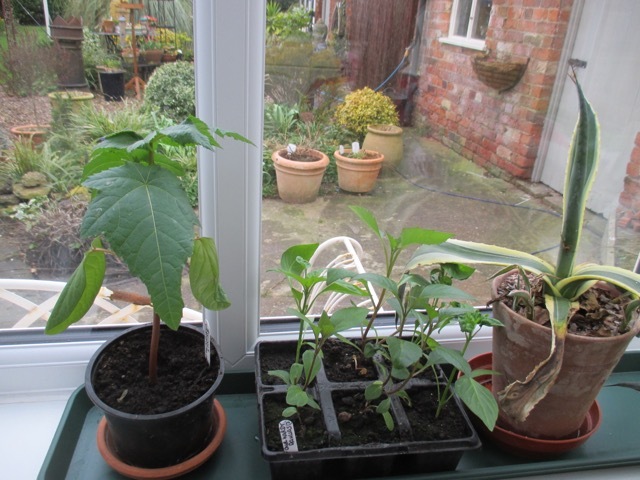 When my Dahlia imperialis gets going again, presuming it does, would you like a cutting? It doesn' t flower, but is very dramatic at over 8 feet with bamboo- like stalks. Thank you for your kind offer, Chloris, I would really appreciate a cutting of your Dahlia Imperialis, and will send you a little offering in return. Variegated Agave pup any good? If not, how about a rose cutting from last year? Good luck with your experiment. Like Chloris, I did not realize there were so many Ricinus. Hi Alain, they are germinating already and growing in front of my very eyes! I have not grown many of these varieties before , particularly the taller ones. 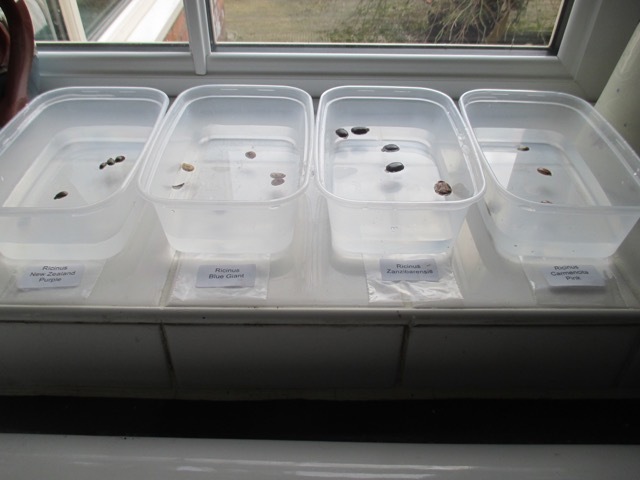 You have reminded me to get on and sow some Ricinus seeds, I will soak them for 24 hours. 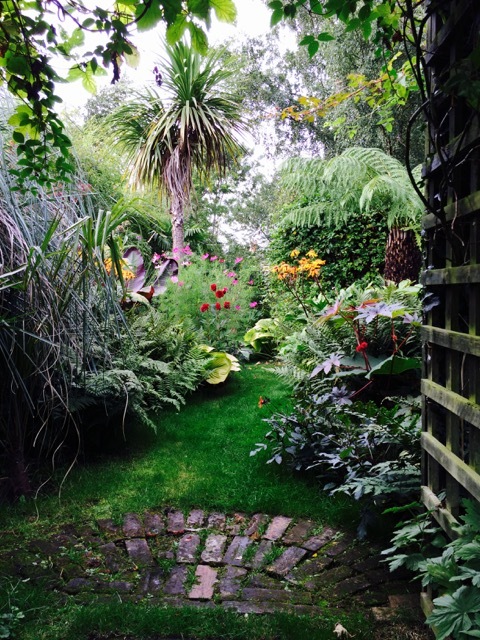 I look forward to seeing the exotic garden this year. 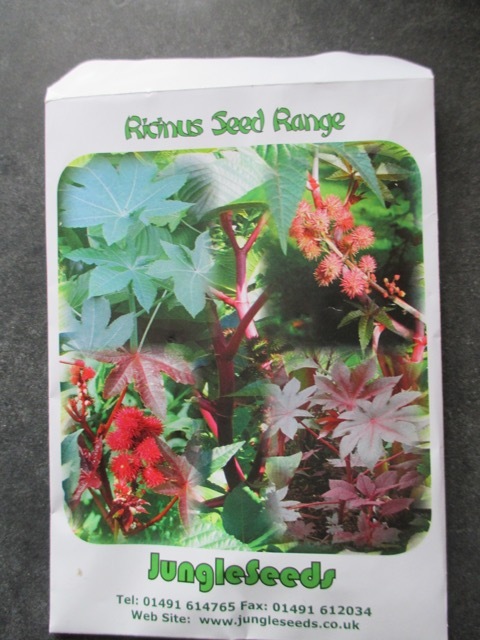 Thompson & Morgan had a great offer on for seeds at 50p per packet, and I'm pretty sure Ricinus were included in the offer. I got lots of packets of different seeds which I really do not need but was unable to resist ! Careful,Jane. These days one person's ornamental Ricinus planting is some Homeland's terrorist hotbed! Ha ha ha! Think I'm ok as mine rarely set seed!! Good info about the soaking. Seeds I have started did well but then resented the transplant into the garden. I was thinking of direct sowing this year. They can't be beat for dramatic effect. That is interesting Ricki, and I will be interested to hear how that goes for you. Our springs are far too cold to do that, and to direct sow when it IS warm enough would not give enough growing time for the plant to develop well. I have noticed that they do not like being planted out and always sulk for a while. I always assumed it was the change in temperature which was responsible ? The internet is a wonderful thing! What are you growing this year Janet? 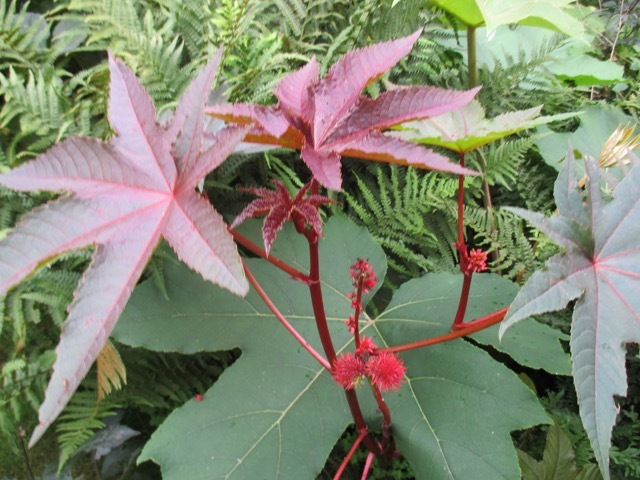 Ricinus are interesting plants Jane and I am really pleased you can grow them although no good for me with my conditions. Thank you for emphasising their toxicity, I know that many plants are toxic but there are too many decorative poisonous plants sold in the national press often without a warning, Datura and Oleander spring to mind. To be quite honest the chances of them poisoning someone don't concern me as it happens rarely. What does concern me is that they are sold without warnings purely for commercial gain. Gosh, Rick, that is a timely warning as I wasn't even aware of the toxicity of Datura, and have a large plant in the greenhouse! Is it just the seeds ? Apparently the seeds and flowers are the most toxic parts although I am sure there is plenty of information on the inter-web. The main thing is that it is a member of the notorious Solanaceae which as I am sure you know includes nightshade etc. but also potatoes and tomatoes strangely. I've never grown these and don't have many tropicals in my garden. But I do love the lush look they give. I hope the other seeds get their butts in gear and grow! Thanks for comments Tammy, I am growing more and more tropical/ faux tropical stuff as the years roll by. It is so satisfying because they usually grow so FAST! It's good that you managed to find the information on the trial. You are giving your seeds the best start they could wish for. Ricinus is a plant I am totally unfamiliar with. Looking forward to seeing how they look in your tropical garden. Garden tools come in a variety of shapes and sizes. People who are keen on gardening will need to procure some of these implements before they can begin the process. A good set of tools can be found at most home improvement stores.